Mergulhe na cultura explosiva da Catalunha em uma viagem à noite para uma aldeia local de Barcelona. Experimente o fogo e as chamas de um festival de fogo enquanto você testemunha aldeões vestidos de demônios e ver fogos de artifício de tirar o fôlego iluminando o céu noturno. Ganhe uma visão fascinante sobre a história desta celebração extravagante de um guia experiente, em seguida, dance e mergulhe no drama desta experiência única em um pequeno grupo limitado a 14 pessoas. Esta excursão libera o acesso a uma experiência catalã tradicional que somente os moradores locais conhecem. Suba a bordo de um veículo de luxo no centro de Barcelona e aventure-se em uma das aldeias locais que apimentam o interior da Catalunha. 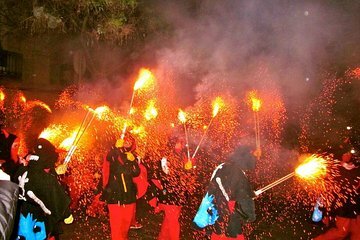 Obtenha informações sobre a origem dos festivais de correfocs a partir de seu guia experiente enquanto admira seus arredores cintilantes à noite; Saiba como a tradição catalã começou no século XII e como as chamas e a frivolidade representam uma luta entre o bem e o mal. Chegue na aldeia e seja levado para a atmosfera exuberante criada por decorações de rua e fantasias coloridas; admire a variedade de efígies e explore a vila como se estivesse em lazer antes do espetacular show ao ar livre começar. Desperte seus sentidos para o ritmo pulsante da bateria enquanto os fabulosos fogos de artifício entram em ação e os locais dançam em meio a uma chuva de faíscas. Mergulhe na ação e persiga ousar demônios através da multidão, ou admire as festividades do lado de fora. Em um momento pré-marcado com seu guia, retorne à minivan e reflita sobre sua experiência exuberante durante a viagem de volta a Barcelona. Loved this trip, it was well worth taking the time out to visit. The experience was fantastic and our guide was wonderful. She was informative, friendly and very caring. I highly recommend this. This by far was one of the best things I did while in Barcelona. My guides were amazing. I was late getting to the meeting location and they didn't mind waiting for me. It was like being in the center of a fireworks display. I enjoyed every minute of it and would do it again and again. This was our favorite tour in Spain (Madrid, Sevilla, Malaga, and Barcelona). It took about 1-1/4 hours to get to the Banyoles village. Our tour guides, Barbara and Alex of LivingIt, were outstanding! We were treated like royalty at this annual festival where this year, the children were running down the street. We wore the protective caps provided by LivingIt and we were so delighted to run with the children. After the event, we visited with the devils, experienced local food, and took a group picture with all the locals. This was a highly memorable experience. The next day we bought a Catalonian flag in honor of their cause and these wonderful people. The tour is expensive and long, but worth every minute of it. This was the best tour I have ever been on. It was great from start to finish. The tour guides included us in the whole show. We met the fire running team members and had the time of our lives. Can't recommend this tour highly enough.